referred to as adheenams. Among them "Tiruvannamalai adheenam" founded by Daivasikamani Desikar was one of the most important. It had several branches all over the land and the one at Kunnakudi was the most prosperous. Perhaps for this reason one of the successor heads, made it his headquarters. The samadhi of Deivasikamani was built at Kilnathur, a suburb of Tiruvannamalai. A temple also was constructed over the Samadhi. This came to be known as Gurumurtam. At the time of this story, pooja and other services at Gurumurtam were being performed by Annamalai Tambiran. Tambiran also once stayed at Kunnakudi but left the place and moved over to Tiruvannamalai for personal reasons. Tambiran spent his time singing thevarams (the Saivite hymns composed by Appar, Sundaramurti and Jnana Sambandar), performing pooja at the Samadhi, going out and collecting alms of which he distributed some to the poor. He led a very principled and austere life. Swami too. So he broached the matter with Nayanar. Both of them pleaded with the Swami saying, "Gurumurtam will be convenient for Swami, there will be no nuisance from the crowds. Yet it is close to Arunachala. Swami must consent to come there." Swami consented. In February 1897, he moved to Gurumurtam and since then he came to be known as the "Swami of Gurumurtam." Gurumurtam: The tapas [?] continued uninterrupted at this place. The austerity became more severe, indifference towards physical comfort increased. The Swami never bathed or cleaned himself, his locks became matted, his nails grew long and curved, his hands fell into disuse. Gurumurtam was full of ants but the Swami cared nothing about it. He was in their midst unmindful of the havoc wrought by them. He was immersed in the Self. To protect the Swami from ants someone provided a stool with the legs immersed in water. But as the Swami was leaning against a wall, the ants continued to infest the place. The area which touched the Swami's back got darkened  this patch could be seen for a very long time even after the Swami left Gurumurtam. attending on the Swami erected temporary barricades to prevent people from coming near him. But the people would not agree to leave without the Swami partaking of the eatables brought by them as offerings. Everyone wanted the punya of offering something or the other to the Swami  this led to quarrels among them also. There had been a time when no food was available at all but now there was a surfeit of it. To solve this, it was decided that only one devotee could offer food on any given day -- there were only seven days in a week but those who wanted to serve ran into hundreds. Even this did not work out well. Above all, what the Swami took was very little, even that only once a day. All the offerings would be mixed up and as quite a lot of milk formed the major part of the offerings the mixture became fluid. The Swami would open his eyes only once around midday, when a tumblerful of this liquid would be offered to him. That was all that the Swami took before resuming his meditation. Regulated diet is always advisable. But for the Swami it could not be enforced then or even later. Frustrated at this state of affairs, the Swami once said much later, "the deity in the temple is lucky. People offer him some food by merely showing it to him and take it back with themselves. But here the Swami must accept whatever is offered even if unwell. If I don't touch it, nobody else will." There was no light at Gurumurtam, Swami himself was the light. After a few months a Chettiar arranged lighting. after completing the usual pooja at the math [?]. He went through the usual process, which the Swami could not tolerate. Tambiran thought that by his example, the visitors' devotion to the Swami would increase. The following day, before Tambiran returned from the town the Swami wrote on the wall in Tamil with a charcoal piece, "This is enough for this" and showed it to Tambiran at meal time. The latter could not understand it. The next day, the Swami added, "Filling the stomach" and showed it to Tambiran. Even then Tambiran did not stop. Only when the Swami went out at pooja time Tambiran realized that the Swami would not accept this service and gave it up. The people did not know who exactly the Swami was  they merely referred to him as "Brahmana Swami" or "Gurumurtam Swami". After seeing that the Swami wrote on the wall for Tambiran they concluded that the Swami was a Tamilian, well-versed in Tamil. A little after this, the original name of the Swami got revealed in the following manner. to the Swami. As he was a good person, the Swami wrote in English "Venkataraman, Tiruchuzhi". Venkatarama Iyer could not make out "zhi" in the spelling. The Swami had a copy of Periapuranam which had hymns by Sundaramurthi on Sri Bhoominateswara. As the Swami had studied it at Madurai, he picked up that portion of the book and showed it to Venkatarama Iyer and thereby cleared his doubt. At that moment Tambiran was present and thus he got to know the Swami's original name. 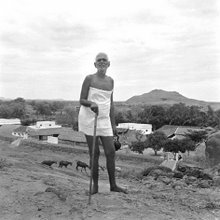 After about two months, Tambiran asked Nayanar to look after the Swami as he had to leave the town for about a week. But he never returned for nearly a year. Meanwhile, a few weeks after Tambiran left, Nayanar was summoned by the management of his math [?]. Hence he also had to leave Arunachala. The Swami was left without any attendant. references to the Swami, Palaniswami went to Gurumurtam. By then, the Swami had been at that place for about five months. How could anyone fail to develop devotion to the Swami watching his state? Palaniswami thought, "This Swami is my refuge. Devotion to him will surely help me immensely," and began serving the Swami. To start with, he worshipped the stone Vinayaka also, but as his devotion towards the Swami increased, he thought, "It is because of my pooja of Vinayaka, that I have obtained this guru. Why continue with that pooja anymore?" From that day, he never left the Swami who was his all  father, mother, guru and God! With the arrival of Palaniswami, the nuisance of the crowds lessened for the Swami. During his absence, Palani would lock the door from outside, leaving the Swami within. This arrangement helped the Swami a lot in his meditation. He lost all awareness of day and night, day of the week, east and west! Because of such severe austerity he became utterly weak and incapable of getting up and walking even a few steps. In such a state, he fainted once as he neared the door. He was not even aware that Palaniswami caught hold of him and prevented him from hurting himself. As his intake of food was almost nothing the normal body functions got badly disturbed. An interesting incident occurred once, which demonstrates the utter detachment of the Swami. In the garden close to Gurumurtam there were tamarind trees. Some old thieves, no longer capable of undertaking arduous jobs, thought of stealing tamarind from the trees. There was no one around except the Swami who was alone without his attendant. The thieves saw him and apprehended that he might watch them and inform others. One of the thieves said to the other, "This man sits motionless with his eyes closed and does not utter a single word. Let us pour some cactus juice in his eyes and see if he reacts." Yet the Swami did not move or say anything. He seemed to be completely unconcerned about what happened either to his body or to the tamarind trees. The thieves were astonished at this extraordinary self control of the Swami and told themselves "Let us leave him alone and get on with our job." The Swami stayed at Gurumurtam for a year and a half. People always used to go there and disturb the Swami's tapas [?]. Close to Gurumurtam was a mango grove whose owner, Venkataramana Naicker invited the Swami to stay in his garden so that he could be in peace. He also assured the Swami that nobody would be allowed to visit him without his permission. At this request, the Swami, and with him Palaniswami also, moved over in April-May of 1898. Two platforms were erected for them amidst the mango trees and there both of them lived, like watchmen.